Let the professionals remove you current bathroom installation. 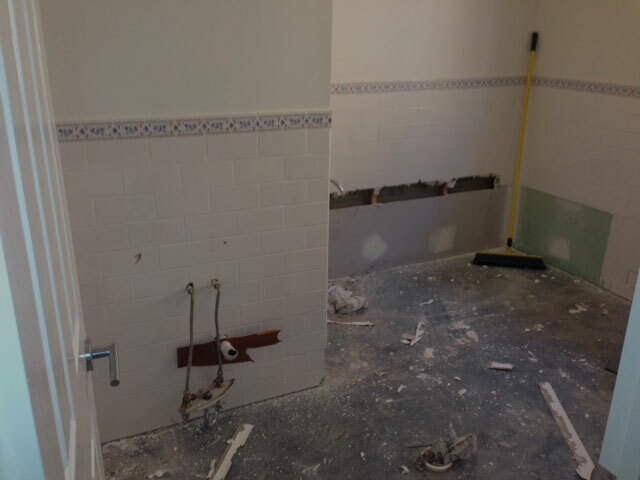 Whether it’s your own home or an investment property, you have two choices when it comes removing your old bathroom. cost-effective professionals to remove your bathroom in a day while you are at work, with no mess, no fuss, no sweat. We’d take the second option every time. Renovating a bathroom doesn’t have to be painful. It doesn’t even have to be expensive either and we’ll give you a free, no-obligation quote before you decide if you want to move forward with the job. Our workmen will then come equipped with exactly the right tools for the job, to remove baths, basins, toilets and bidets; remove tiling; get rid of water pipes; and remove shower stalls, fixtures and fittings. We can also remove your floors while we’re at it and demolish any walls or other structures if required. We will also remove any debris and clean the site before we leave. Why should I get a professional to do my bathroom stripout? There are a lot of moving parts when it comes to a domestic bathroom stripout (literally!). We know how to cap off the mains, disassemble a shower partition and remove a pre-1980’s toilet. All with minimal, fuss, hassle and mess. Decades of experience have also made us one of the quickest Melbourne bathroom removal companies, and we shoot to do all but the biggest and trickiest jobs in a single workday. At Hard Labour we try to work around your schedule and cause you minimal hassle and disturbance. be able to put you in touch with other tradesmen for the next stage of your bathroom renovation. Imagine what it would feel like to go to work before we arrive and come back to a clean, stripped out bathroom, ready for the installation of that chic French bath or ultra-modern wash basin. Fill out the form to your right and we’ll get in touch so you can experience it for yourself.